Yoshy bets you’ve been tired of watching our white world, haven’t you? 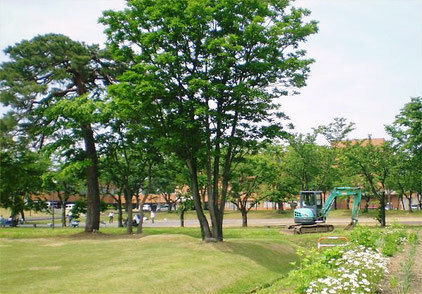 Let me introduce and enjoy a vernal scene at the west side of LL Shihoya Arai School, taken on May 30th last year. On that day, a water-stream for agriculture used about half century ago had changed into a ditch for a snow-flowing gutter and it’s been used now. The New Year’s party of the 1st group of Kanmachi where Yoshy’s family live was held on Sunday, January 20th. It took about 20minutes’ walk from Shihoya Bookstore / LL Shihoya Arai School where Yoshy lives to the place, a Japanese restaurant. Yoshy and R purposely walked there by walking on back roads where no car uses. Water-streams there had been all covered with three-fold concrete. Yoshy said to myself, “As suspected!”; which you think unexpected, I guess, but I was disappointed a lot. Yoshy couldn’t feel any atmosphere of small creatures like insects waiting for spring at all. As you understood me, Yoshy can’t be a politician!